Event participation is open to amateur cyclists with a medical certification of fitness for competitive CYCLING (not athletics or triathlon). Open to anyone with a license issued by the FCI or by any of the sports promotion associations that have signed an agreement with the FCI for 2019, and to anyone presenting a Bike Card together with the license from his or her own association, as specified in the convention described on the FCI site (https://www.federciclismo.it/it/article/2018/03/13/in-distribuzione-la-bike-card-2018/96424b3b-bbb2-408e-a493-e0584bcbb8c4/; this pertains to 2018). Also open to any amateur foreign cyclist holding a UCI license issued by his or her respective national cycling federation for the 2019 season and upon presentation of the ethical certification in English and certification of fitness following model E. Foreign riders without a UCI license must submit, before the start of the event, a medical certification attesting to their fitness for participation in a competitive cycling event. This certification must not have been issued more than one year prior to the date of event registration. The event is also open to all those without a license; these riders will be issued a one-day FCI license for a fee of €15, which provides liability insurance during the event. The one-day license will be issued only upon presentation of a valid medical certification of fitness for competitive cycling (not athletics or triathlon or other sports), regardless of the route selected. In accordance with FCI regulations, the minimum age for participating in the Medio Fondo or Gran Fondo is 19 years. For those over 64, the Medio route of 133.8 km is obligatory. According to the new federation regulations, every rider must be in possession of a medical certification of fitness for competitive cycling. Participation in the event is by invitation, and the organizing committee may at any time and at its sole discretion decide whether to accept or reject a rider’s participation or to exclude a rider if the committee believes that the rider’s presence would damage the image of the event. By signing and submitting the entry form, the rider, together with the representative of his or her team, certifies that there are no sporting sanctions, civil and/or criminal proceedings, or investigations pending against him or her for facts relating to doping, and declares that he or she has not taken – and will not take – substances included on the World Anti-Doping Agency (WADA) list of prohibited substances (https://www.wada-ama.org/en/resources/science-medicine/prohibited-list-documents). False self-certification will be prosecuted according to law. Professional, elite (men and women) and Under-23 riders are permitted to ride only in a promotional capacity and at the invitation of the organizing committee and may not participate in any way in the classification. In the case of a positive doping control carried out at the Sportful Dolomiti Race, or a positive result returned in the six months following the race, the rider will be required to pay to the organizing committee, as compensation for the severe damage caused to the image of the event, the sum of €50,000.00 (fifty thousand euros). If the rider belongs to a sports club, the club will be jointly and severally liable for payment of the penalty. The amount will be donated to support youth sports development. The classification will be published in printed form and on the event website, www.sportfuldolomitirace.it, where you can print a personal certificate. Register ONLINE VIA CREDIT CARD at www.sportfuldolomitirace.it on the online registration page that directs to the Endu site. Friday, June 14, 2019, from 12 p.m. to 7 p.m.
Saturday, June 15, 2019, from 9 a.m. to 7 p.m.
For GROUPS of more than 15 participants, race packets must be picked up at the group pickup table; the list must be sent to the administrative office at info@sportfuldolomtirace.it by June 12, 2019. In the event that a rider does not participate in the event, the registration fee will not be reimbursed. If a rider is unable to participate, he or she MUST communicate this by fax or email before midnight on June 10, 2019, so the fee can be applied to the 2020 event. A registration held over to the next year is valid for that individual only and is nontransferable; it is valid only for the year following the cancellation. Those who did not participate in the 2018 event and notified the organizers within the required time frame and as specified in the rules are considered “withdrawals.” These riders must reactivate their registration by submitting a fully completed and signed “2018 withdrawals” form to the administrative office via email or fax by no later than March 31, 2019. After this date the registration can no longer be reactivated. Rider substitutions are allowed only through June 3, 2019, and for this procedure an administrative fee of €5.00 will be charged. The rider substitution form can be downloaded from the registration page of the event website. The organizers will immediately DISQUALIFY anyone caught moving up in the grid or found in a group to which his or her number does not belong, unless authorized by the organization, or anyone using the race number of another rider without having communicated the substitution as specified in the rules. A top-of-the-line Sportful Dolomiti Race cycling jersey, designed by Sportful, which will be unveiled on the site as soon as the graphics have been finalized. During the course of the event, riders may freely choose the route best suited to their abilities as long as they respect the checkpoints along the routes, at risk of disqualification from the final classification. 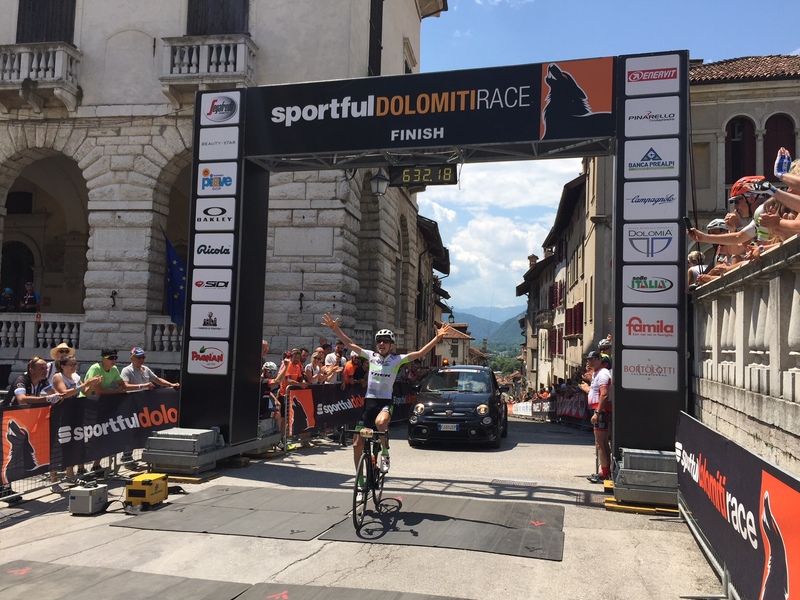 The Sportful Dolomiti Race is a competitive cyclosportive event, and therefore it is absolutely obligatory that riders respect the rules of the road. Riders passed by the “FINE GARA CICLISTICA” (“END OF BIKE RACE”) vehicle continue in the event as touring cyclists, retaining their race numbers and respecting the rules of the road. The race number must be visible on the handlebars and not rolled around the frame; the other number provided by the race organizers is to be pinned to the back of the jersey. These numbers may not be modified in any way. A standards-compliant hard-shell helmet must be worn, buckled, for the duration of the event. To protect the environment, it is absolutely forbidden to throw trash of any kind along the road; all waste must be placed only in the containers located near the feed zones and at the finish, as designated by the “ECOZONE” signs. If race organization personnel or officials see a rider disregarding this rule, he or she will be disqualified. TIME LIMITS AT CUTOFF CHECKPOINTS: Castel Tesino: 10:00 a.m.; Predazzo: 2:30 p.m.
Any other prizes will be communicated at the start. TEAM CLASSIFICATION: The team classification will be based on the number of registered members who start. Private follow vehicles are forbidden, at risk of disqualification of the riders assisted. Any vehicles identified as following the race and not authorized by the organizers to be between the “begin bike race” and “end bike race” vehicles will be photographed and reported to the competent authorities. If the event does not take place due to any cause beyond the control of the organizers, the registration fee will not be refunded. In addition, all riders must wear a standards-compliant hard-shell helmet and must keep their race numbers attached and visible, both on the bike frame and the back of the jersey. Broom wagon service will be available at the back of the group for riders who withdraw from the event. The riders’ bicycles will be deposited in the secure bike parking area as the vehicles return from the route. The vehicles carrying the bikes will not necessarily return at the same time as the vans/buses with the riders. Secure bike parking is available at the finish and can be accessed by presenting the race number that corresponds to the number on the bike frame. All the bikes collected by the broom wagon service will be placed here as well, as the vehicles return. Any claims must be presented to the jury within the required time limit and accompanied by the fee specified by the FCI. The organization accepts no responsibility for any accidents or damage to persons, animals or things taking place before, during or after the cycling event. All event participants must respect the rules of the road. For any issue not addressed by these rules, the rules of the FCI’s national amateur organization apply.